Several weeks after seven uncontacted Indians emerged near the Brazil-Peru border, more uncontacted Indians have made first contact with Brazilian government agents, reportedly fleeing attacks in Peru. A second wave of highly vulnerable uncontacted Indians has made contact with outsiders in Brazil’s Amazon rainforest, just weeks after Brazilian experts warned of “genocide” and “extermination” of the tribe. The group of around two dozen Indians is believed to include men, women and children who reported fleeing attacks by invaders in Peru. According to Brazil’s Ministry of Health, the Indians are in good health and have been residing at the “Xinane” government monitoring post. The contact follows a similar incident at the end of June 2014, when seven Indians from the same tribe made contact with a settled Asháninka indigenous community and agents of FUNAI, Brazil’s indigenous affairs department, in Brazil’s Acre state near the border with Peru. The Indians were given emergency medical treatment for an acute respiratory infection and briefly kept in “quarantine” before returning to their community in the forest. Campaigners have criticized the lack of protection of uncontacted tribes’ land in Peru, following the Indians’ reports of being brutally attacked and their elder relatives “massacred” by invaders on their land, believed to be cocaine traffickers. While Peruvian and Brazilian authorities signed an agreement to work together to protect the land of uncontacted tribes in this area in March 2014, illegal loggers, drug traffickers and oil and gas companies continue to put uncontacted Indians at extreme risk of violence and diseases. 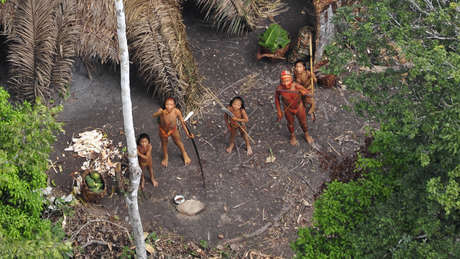 Uncontacted Indians made first contact with outsiders at the end of June, 2014, and were treated for an acute respiratory infection which could decimate their tribe. An interpreter who accompanied the first contact said, “The majority of old people were massacred by non-Indians in Peru, who shot at them with firearms and set fire to the houses of the uncontacted. They say that many old people died and that they buried three people in one grave." Uncontacted tribes are the most vulnerable societies on the planet. They have little or no immunity to common diseases like the cold, flu, or measles and could be wiped out by epidemics or violence from outsiders on their land. Over 11,000 people have sent an email calling on Peru and Brazil to protect uncontacted tribes’ lands as a matter of urgency. - A video of the extremely rare encounter at the end of June was first published on Amazonia Blog.